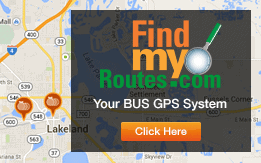 Public transit in Polk County is provided by the Lakeland Area Mass Transit District, operating as Citrus Connection, which includes all public transportation within the County including Winter Haven Area Transit, rural routes servicing Bartow, Fort Meade and Frostproof, as well as all paratransit service. For years, public transit was made up as three agencies operating independently of each other, creating some challenges for riders who want to utilize the transit system throughout the County. Today, those services, personnel and assets are together working to bring you a top quality transit system under one simplified banner, Citrus Connection. Citrus Connection operates in accordance with Title VI of the Civil Rights Act of 1964 and Related Statutes. “No person in the United States shall, on the ground of race, color, or national origin, be excluded from participation in, be denied the benefits of, or be subjected to discrimination under any program or activity receiving Federal financial assistance” (42 U.S.C. Section 2000d). The Environmental Justice component of Title VI guarantees fair treatment for all people and provides for Citrus Connection, to identify and address, as appropriate, disproportionately high and adverse effects of its programs, policies, and activities on minority and low income populations, such as undertaking reasonable steps to ensure that Limited English Proficiency (LEP) persons have meaningful access to the programs, services, and information Citrus Connection provides. Citrus Connection works to ensure nondiscriminatory transportation in providing public transportation for all Polk County area citizens. Citrus Connection is committed to responding to request for reasonable modification of their policies, practices, or procedures. Riders may request a modification from an operator for example a passenger with diabetes or another medical condition requests to eat or drink aboard a vehicle in order to avoid adverse health consequences. The request should be granted, even though Citrus Connection have a policy that prohibits eating or drinking while onboard the vehicle. Such as a person with diabetes whom needs to consume a small amount of juice in a closed container or a candy bar in order to maintain blood sugar level. Additionally, a request may be submitted to Customer Service prior to an event requesting written materials be printed in a large font size. Another example, when Fixed Route bus stop is obstructed by construction passenger may request an alternative bus stop for safe boarding. These are only three examples of a modification that may be requested, please consider the guidelines below when requesting a reasonable modification with as much notice as possible in advance. Submitting an Reasonable Modification Complaint: Reasonable Accommodation Request Form. When a modification is requested, and it appears practicable, operators are required to decide if the modification should be provided immediately. Operators may consult with a supervisor or manager before deciding to grant or deny the request. Without the requested modification, the individual with a disability can fully use the entity’s services, programs, or activities for their intended purpose. An ADA Complaint can be filed by following the ADA Complaint Procedure or Procedimiento de queja ADA. An ADA complaint can be filed using the ADA Complaint Form or Forma de reclamo para ADA. Public Transit services are provided regard to race, color, or national origin. If you would like additional information on Citrus Connection’s nondiscrimination obligations or would like to file a complaint, click here. Lakeland Area Mass Transit District encourages you to make your complaint in writing using this Title VI Complaint Form or Formulario de Queja de Titulo VI. Any person who believes himself or any specific class of persons to be subjected to discrimination prohibited by Title VI may by himself or by a representative file an official Title VI complaint with the Title VI Coordinator or with the Federal Transit Administration (FTA). A complaint must be filed within 180 days of the date of the alleged discrimination, unless the time for filing is extended by FTA. Click here for LAMTD Title VI Complaint Procedures or Procedimiento Para Una Queja del Titulo VI.